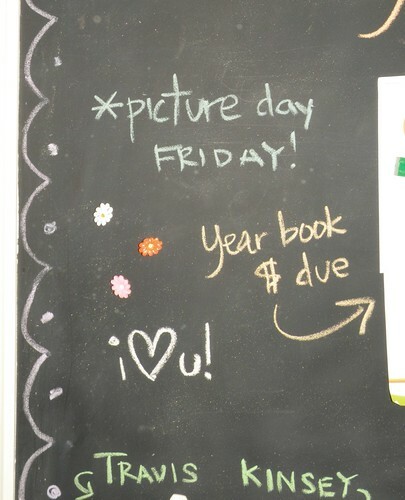 Magnetic Chalk Board Message Station. 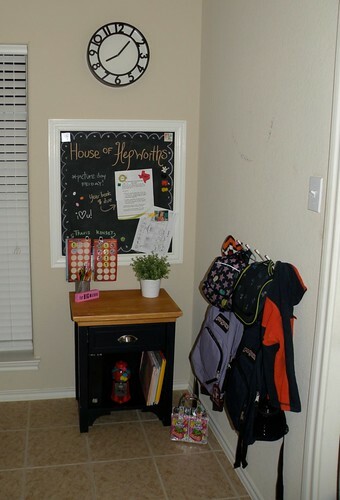 My kids needed somewhere to keep their backpacks, school work, homework, library books, pens & pencils, notepaper, and all the little things they need to get themselves out the door each morning in an orderly manner. I hung a coat hanger from IKEA on the wall for their backpacks, jackets, & lunch boxes, but I still needed somewhere to keep all their extra “stuff” organized. Up until this point they would just throw papers all over the floor. Now when they walk in the door they have somewhere to put their “save” papers, notes to me, homework, etc. 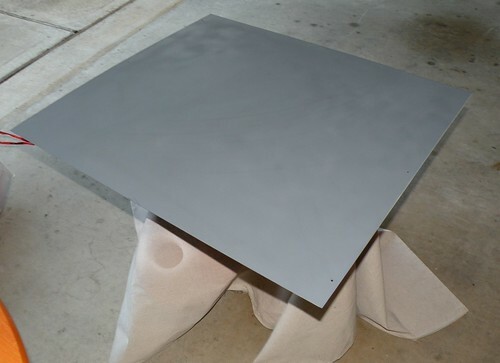 I found this piece of metal on Craigslist for FREE! I decided it would make the perfect message center because it was magnetic. 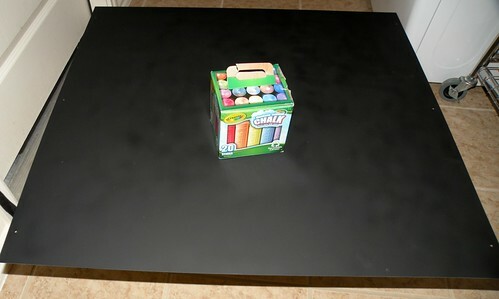 From there I took it one step further and added chalkboard paint. I did two coats and let it dry a full 24 hours before I added the chalkboard paint. 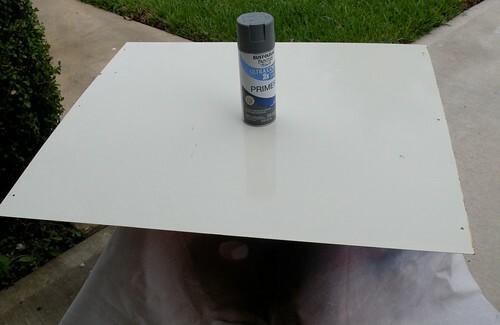 Then I coated it with chalkboard spray paint. 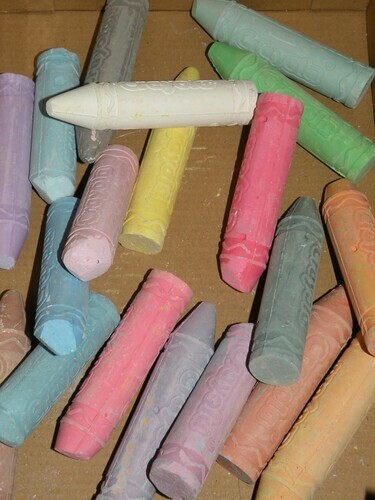 I wanted to make sure it wasn’t splotchy so I did several coats – I used the entire can of chalk paint. Once it was dry I seasoned it. Basically just color the entire board, and then erase it. The metal had three holes on either end already drilled in it, so I just used those holes to nail the metal to the wall. Time to frame it out with moulding! 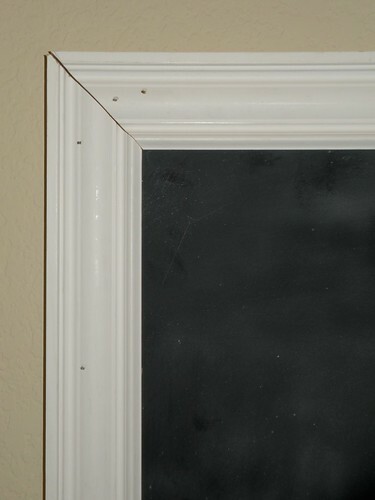 I measured the length and width of the metal board and then cut 4 pieces of moulding to fit around like a picture frame. I used a nail gun to hang the moulding, but you can easily hang it with a few nails and a hammer. 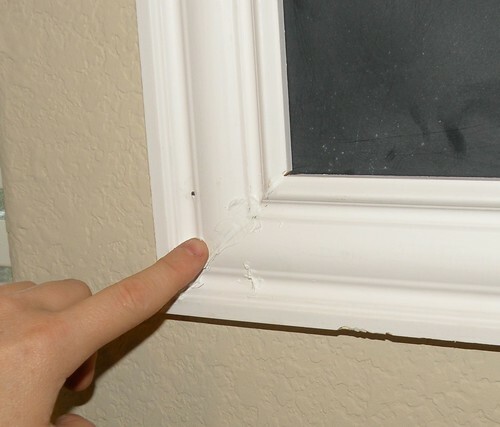 Be sure to level your moulding before you nail it down! 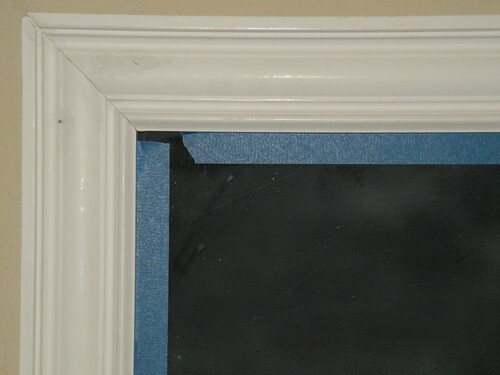 You don’t want to end up with wonky moulding! 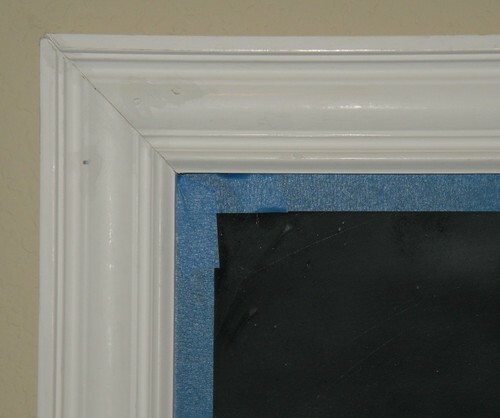 When you hang moulding it doesn’t look so pretty at first. 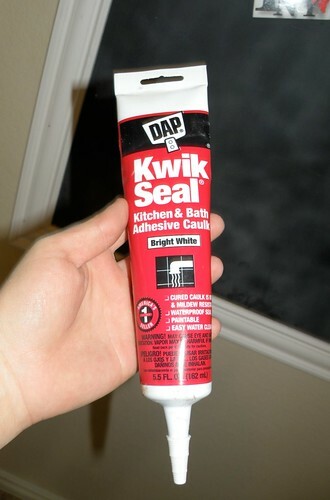 You can use all sorts of things to fill these holes, but I prefer caulk. 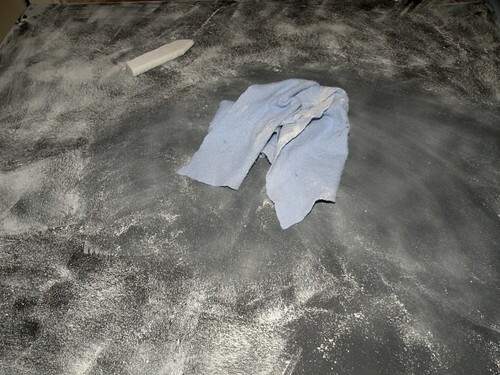 And then smooth it out with your finger (wipe the excess on a paper towel). Now it’s time for paint! First you need to tape it all off. 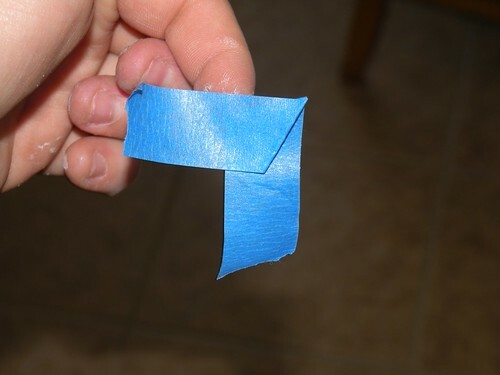 Take a piece of painters tape and fold it into a 90 degree angle. Then just stick it into the corners. Once it’s taped off it’s easy to paint. I used high gloss white paint. Once it’s dry, take the tape off and add your accessories! I love that the message center is magnetic as well as a chalk board. 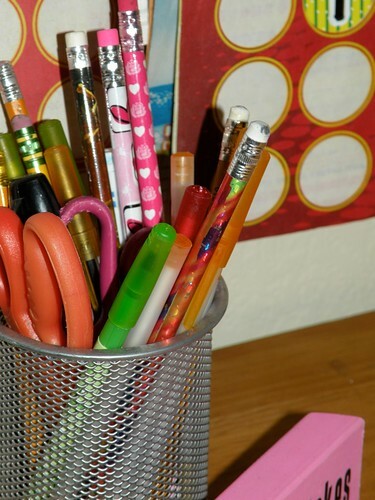 I can write reminder notes to the kids as well as use magnets to hang all their papers and work that needs to go back to school. 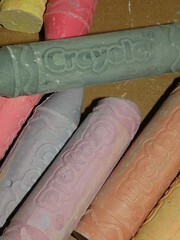 I keep the chalk in the drawer of the little table. 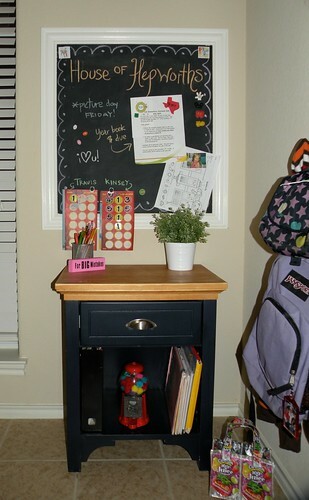 I LOVE this Magnetic Chalk Board Message Center! 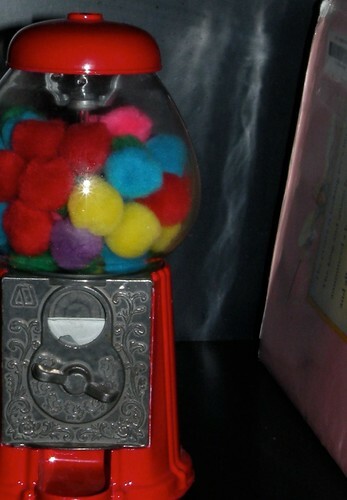 In addition to being totally functional and organized, it’s also just so cute. It’s adorable!! 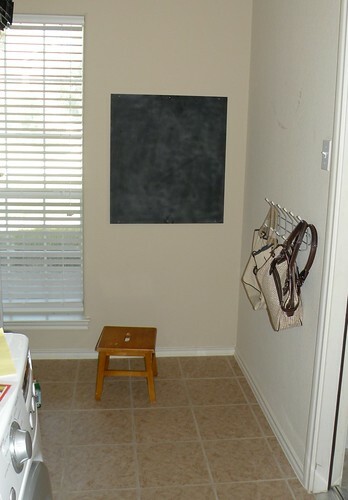 This is WAY cuter than a lot of the other chalkboard stations I’ve seen. Pottery Barn, watch out! So great! Love the idea of framing without really framing – I’ll need to remember that! It looks great Allison. 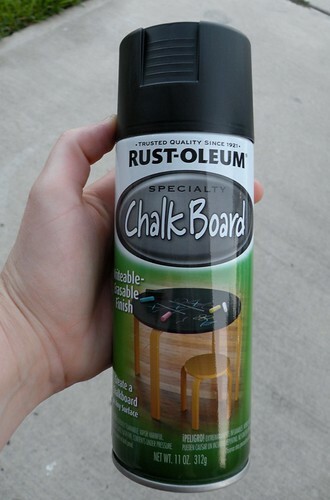 I love chalkboard paint. Have a great week. Free from Craigslist?! That’s awesome! It looks great! 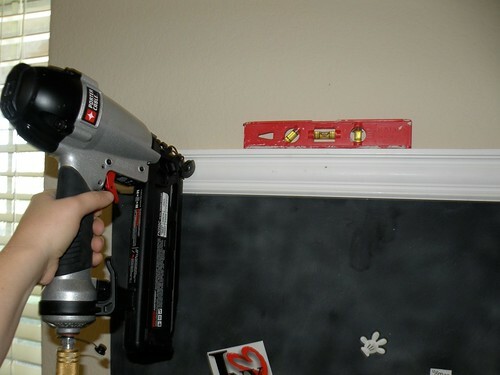 I’m so impressed with the power tools you used! AND the fact that you keep your kids HEB stickers! I usually toss them as soon as we get home! What a good Momma you are! It looks fantastic, and how functional! 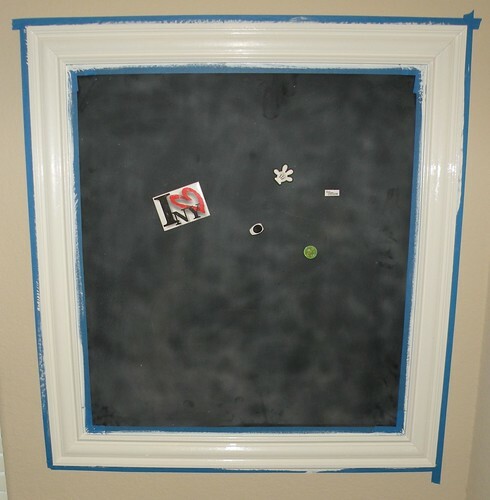 I’ve wanted to do this with an old mirror but had worried that the chalkboard paint would scratch off of the glass surface. 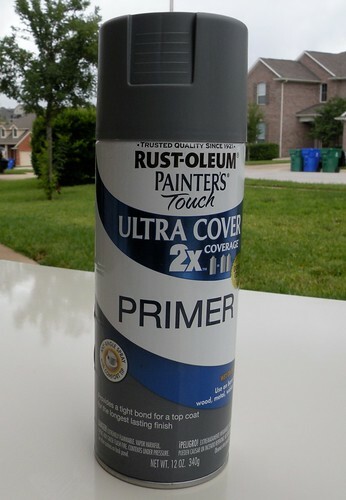 I would think the paint would adhere to metal & glass similarly so I’m anxious to hear if you get any scratches! Looks fabulous!!! 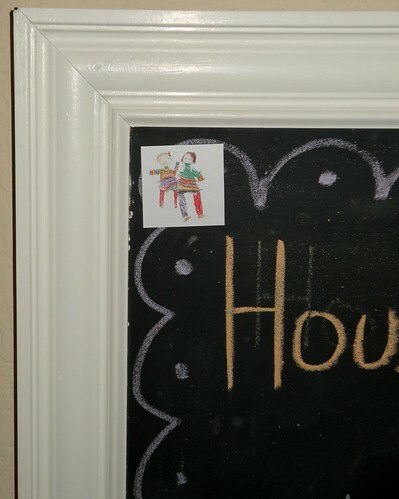 Love the magnetic chalkboard feature. That turned out fabulous!! I love it! Your writing looks so much better than mine!! Very nifty. You’re such a clever chick!! Looks very functional. Great job. Now where in God’s name did you learn to make a frame like that?? You are just a very surprising and talented woman, aren’t you??!! I am so, so impressed! Love your project and your blog! I made a rather large chalkboard for a show. I’m using your border for inspiration. 🙂 Hoping it sells quickly since it will have such a cute outfit. 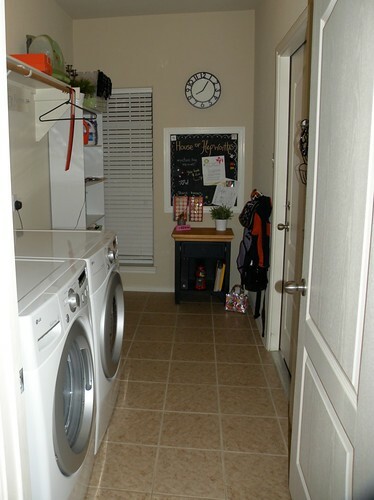 Allison, your mud room looks terrific overall and the blackboard just adds to it. 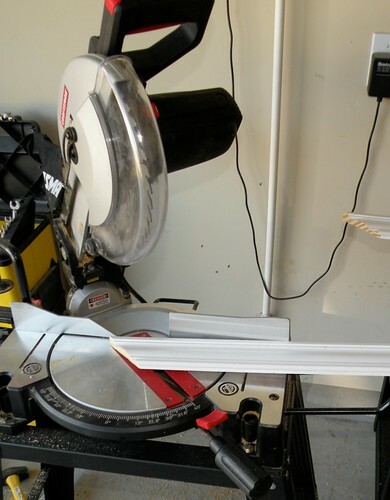 And woman, you own a mitre saw. You’re my idol. Hope you’ll stop by and see our upholstery effects. Jane F.
Love your multi purpose board! Perfect! You did an amazing job- and yes besides being functional and all that good organizational stuff- it is dang cute to boot. I absolutely love this idea. And even more impressed that you made it from scratch – I really couldn’t tell when I saw the first picture that it was homemade! Loving that it’s magnetic, too. I want a corner like this. Yes, I do. 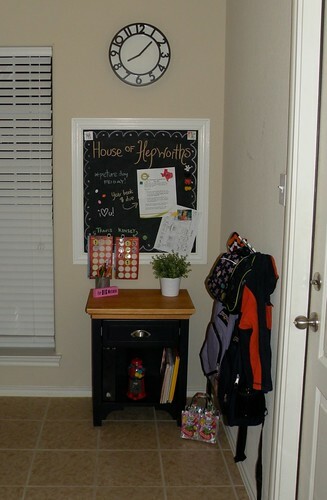 Loving that message board- GREAT IDEA!!! Love it! 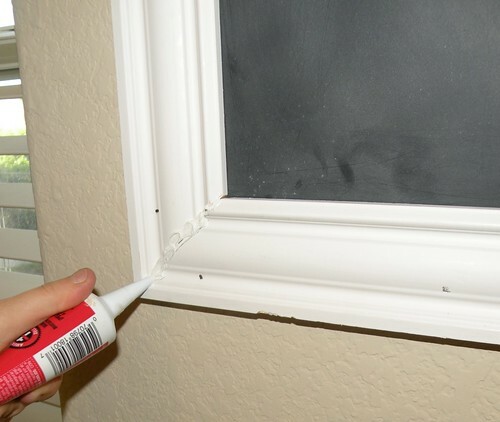 I linked this to my chalkboard paint project post too, it’s a great tutorial! Just looking at this again now – how is it holding up for you in your house? Still using it? Thanks!